Bluetooth—it’s everywhere in modern life. Precisely because you can control it from anywhere. Well, anywhere close by. 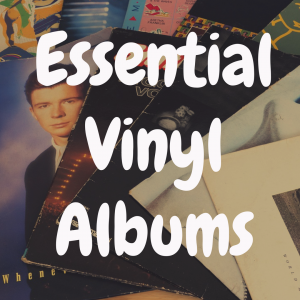 And chances are that if you’re a vinyl record buyer, you’re very close to your collection, and like to stay close to your turntable so you can listen to that collection anytime you want. 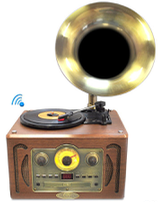 Enter the vinyl record player with Bluetooth capability. This model of turntable has embraced the modern age, for what was once thought to be an obsolete format. 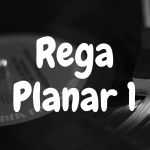 But record playing and buying have enjoyed a comeback of sizeable proportions, enough to allow the turntable to reenter the market as a viable player in the world of audio. 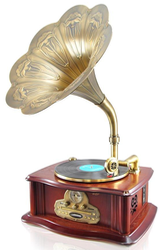 The world has moved on since the days of the phonograph, though, and that means an upgrade in capability. 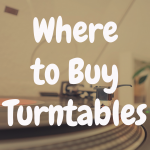 And please take a moment to check out the interactive guide below, where you can compare some of the bluetooth-ready turntables against popular non-bluetooh record players available on the market. Now Bluetooth was designed to give users automated, cordless control over their various devices. Why not make the turntable a part of that arsenal? The question is, does Bluetooth effectively augment the vinyl listening experience? And for those turntables that do the job, which are the best? 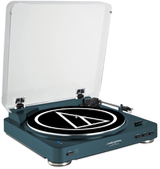 The LP60 from Audio Technica is a stalwart of the modern turntable scene. Durable and reliable with solid sound, it has all the features a modern listener desires in a turntable—except one. The sequel to the LP60, the LP60BT, brings all of the working power of the original with the added bonus of Bluetooth connectivity to any of your devices. What exactly does that mean? Say you’re in the kitchen, busily slaving away over dinner for a few guests. You want a little night music, but the pot’s boiling and you don’t have time to get to your LP60BT turntable in the living room. No problem. Just switch it on via your smartphone. The turntable responds automatically through Bluetooth, which connects devices via radio waves rather than wires. Alternatively, you could be listening to records in your living room and want to continue listening in your bedroom while getting ready for bed. Just connect your LP60BT wirelessly to your Bluetooth bedroom speakers, and you can have your favorite vinyl serenading you to sleep remotely in no time. The only hiccup with Bluetooth – and you’ll run into this with all Bluetooth turntables, not just the LP60BT – is that connections can sometimes be spotty. Meaning you could have skipping—and this time, you can’t blame it on the condition of your record. This is something you’ll have to live with if you want this feature. Bluetooth technology has improved vastly over time, but as with any wireless technology, connections are not always perfect. Much of the choosing between Bluetooth turntables comes down to preference for other brand features, not just Bluetooth itself. You can also read our review of the Audio-Technica AT-LP60 USB here. 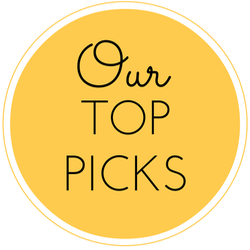 And below, please take a moment to view some of the best-selling record players currently available on Amazon, and then see how well they compare to the Bluetooth-ready turntables we’ll be discussing in-depth today. Let’s now move on to the Yamaha MusicCast Vinyl 500. This is one of the newer turntables on the market that features bluetooth capability–and what we have here seems to be quite a unique experience. The first thing you’ll probably notice is the quality of the turntable. A lot of record players with bluetooth capability can appear…well…very cheap. 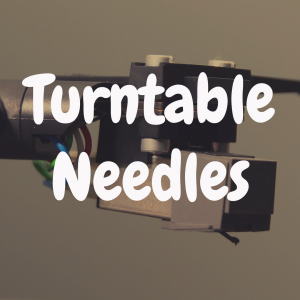 They’ll either feel flimsy in your hands, have a unimpressive amount of heft (especially in the plinth and/or platter), or will feature poorly made parts or materials in essential components of the table itself (like the tonearm or cartridge). Sure, you can shell out over $2,000 for a Shinola Runwell record player that features bluetooth capability, but the average person interested in both a record player and bluetooth wants something good and affordable. I think this is where the Yamaha MusicCast Vinyl 500 settles in quite nicely. Sure, it does cost roughly $600 (and that’s before we even get to to the add-on expense of the MusicCast 20 speakers), but what you’re getting for your money is a solid belt-driven turntable that not only features an aluminum platter and four sturdy feet, but promises to provide you with four ways to connect your turntable to your speakers without wires (Wifi, Bluetooth, Spotify Connect and Airplay). This is a record player with style–without making you feel like you have to sacrifice your future to afford it. And that’s most likely what someone interested in a Yamaha turntable with bluetooth is looking for. It’s likely never going to win any awards for sonic fidelity, but when you’re purchasing a bluetooth record player, I think convenience (more than anything else) is your number one goal. Urban Outfitters has established itself as a go-to clothing chain for Millennials. Since Millennials have spurred the renewed interest in vinyl records, it’s no surprise that UO would take advantage, establishing a deal with Crosley to sell exclusive versions of Crosley turntables in Urban Outfitters stores. 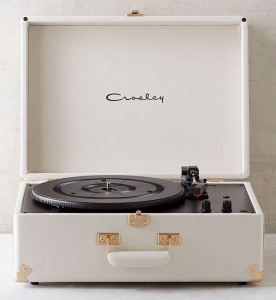 One consequence of that deal is the Crosley X UO Cruiser Bluetooth record player, a version of the popular Crosley Cruiser sold only at UO stores. The biggest talking point about the Cruiser is its style. Crosley has cornered the market on suitcase players that faithfully retain the feel and panache of yesteryear. The Cruiser has a portable style that will go a long way in your living space or wherever you decide to set it down. The Bluetooth capability makes it even more portable, making the player basically another device in your mobile arsenal. The drawback, as always with suitcase players, is sound. Built-in speakers simply cannot replicate spatial sound like a good detached speaker system. You’ll still want to invest in a sound system if you want to get the full benefit from this player. But if you’re young and on the move, you’ll want a stylish player that moves with you and the rest of your devices. If so, the Crosley X UO Cruiser might be for you. You can also read our Crosley-related article entitled Ranking the Best Crosley Turntables on the Market. Another UO exclusive, the EP33, for an uptick in price, solves the problem posed by the UO Crosley player by including a set of detached speakers. The generic speakers will leave something to be desired in the sound quality department, but they will provide some of the dynamism that’s missing from built-in models. This player also sacrifices portability. It’s UO’s model for the home, slightly more expensive, but with expanded sound and the same Bluetooth remote options. When you’re buying a record player from a fashion store, keep in mind that you’re forking over money moreso for design than functionality. The EP33 has the sleek, minimalist design that young apartment dwellers covet, but if you want a system that treats features such as Bluetooth as anything but an accessory, you’ll likely have to go straight to the source. 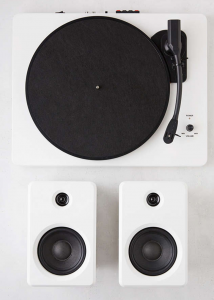 A UO turntable is a lifestyle purchase. More utilitarian models can be found elsewhere. The Air from Ion is a powerful turntable for a more than reasonable price. With features like auto stop for pausing your records mid song and USB connectivity for converting your vinyl songs to digital files, this solid model will get the job done simply as a turntable. A Bluetooth connector for wireless speakers is just icing on the cake. This is a workmanlike turntable. It doesn’t get a lot of style points. It just does its job. That’s why it’s included in this list. In a time when style is often valued over function in record players, the Ion Air doesn’t look like a million bucks, but it does a couple of things, and does them well. If that’s all you need, then this Bluetooth edition may be your table. The coupe de grace. There’s a reason we save this Bluetooth turntable—from the people behind the vinyl-sharing subscription service Vnyl—for last. Trntbl is not just Bluetooth capable. It’s Bluetooth centric. This is a turntable made specifically to work with your mobile devices. It’s billed as the world’s first wireless turntable, meaning it doesn’t connect to anything but a wall outlet for power. The rest, as they say, is blowing in the wind. Trntbl can connect remotely to your Airplay devices or Bluetooth or Sonos speakers. It also has a feature that identifies the music you’re listening to on vinyl, then feeds the information into Spotify, which picks the music out from its own database. So your friends can listen to your latest vinyl purchase along with you. This thing is cool. 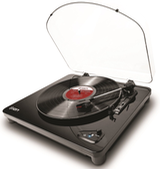 It’s exactly what you want from a modern turntable: innovation and compatibility. 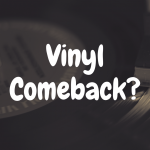 Even the most diehard old school vinyl devotees have to recognize that if the format wants to keep swimming past a second wave of popularity, it has to adapt to the currents. And the currents tend toward networking. You do have to pay for it, and the price point will be prohibitive to some (over $400). But for what it offers in style and functionality, it’s a bargain compared to similar models, precisely because there are no similar models. Trntbl is ideal, but any of the models we’ve talked about today can be serviceable to your Bluetooth needs. As always, it comes down to cost and aesthetics. Bluetooth is Bluetooth. From Crosley to Trntbl, you’ll run into the same advantages and disadvantages with wireless listening technology. Find a price and style that work for you and go for it. When you’re sitting on the porch on a rainy night with your old jazz records piping in from the living room, you’ll be happy you did. If you enjoyed this article, please “like” our new Facebook page! 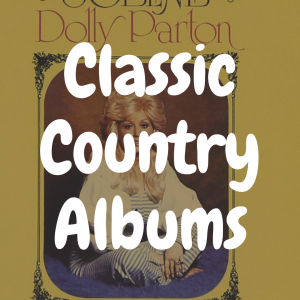 What’s the Best Music Available on Vinyl? What’s the Best Affordable Record Player?